Tibet is the starting point for many of Asia's most important rivers. 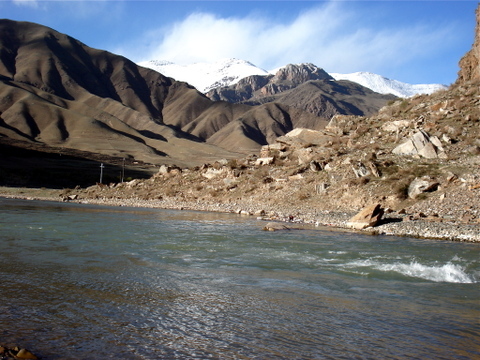 The Mekong River (pictured above) has its headwaters in Dzado county in the Kham region of Tibet. In Tibet, the Mekong River is known as the Dza Chu. From Tibet, the Mekong flows south through Yunnan province in China and then forms the border area of northern Thailand, northwest Laos and eastern Myanmar (the Golden Triangle area). From there it flows south through Laos, Cambodia and Vietnam before dumping into the South China Sea. The Mekong is the 11th longest river in the world with a total distance of 4880kms / 3032 miles (estimate). The Salween (Nu) River begins in central Tibet and flows south through Myanmar and Thailand before ending in the Andaman Sea. Its total length is 2815kms / 1760 miles. 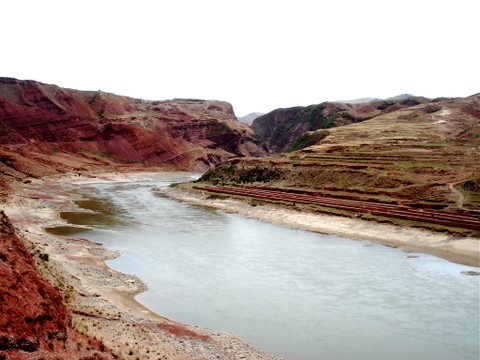 The Yellow River (pictured above) begins in the northern Kham. It is known as the Ma Chu in Tibetan. From the Tibetan Plateau, the Yellow River flows through China. It is considered the "cradle" of Chinese civilization. The Yellow River is the 6th longest river in the world with a length of 5464 kilometers / 3398 miles. Along the headwaters, the Yellow River is very clean, but by the time it works its way through the central and eastern regions of China, the river is quite polluted. The Yangtze River (pictured above) is known as the Dri Chu in Tibet. It is the longest river in Asia and the third longest in the world after the Nile and Amazon Rivers. The Yangtze River extends 6300kms / 3938 miles across Tibet and China before ending in the Pacific Ocean near Shanghai. During the winter, the Yangtze is frozen along the headwater regions in Tibet. The picture above was taken in early December with large ice pieces having already formed. 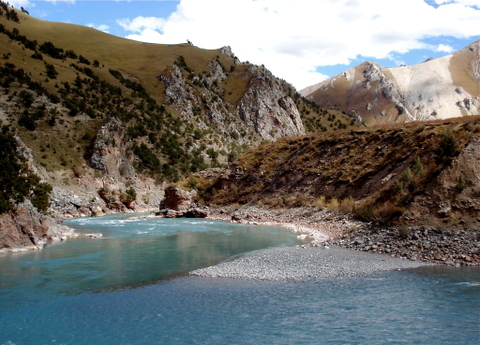 The Tsangpo River (pictured above) is the most important river found in central Tibet. The Tsangpo flows through the fertile Yarlung Valley. 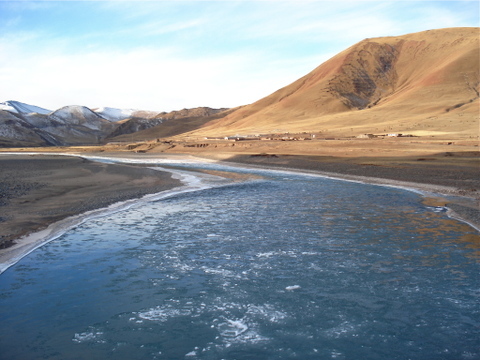 The river originates near the holy mountain of Kailash in west Tibet. As it flows east, it passes through many deep canyons. It is a very popular river for whitewater rafting and kayaking. After passing through Tibet, the Tsangpo turns south and flows through India, where is is known as the Brahmaputra River. Rivers in Tibet originate high up in the world's highest mountains and flow down through the numerous valleys of China, India and Southeast Asia. Downstream many of these rivers are quite polluted, but at their sources in Tibet they remain clean, pure and beautiful. This last picture is of the Tongtian River near Jyekundo, which is a segment of the Yangtze River. Great Information showing why China wont live Tibet due to its only water source. I hope water agreement and mineral deal with the Middle kingdom will give Tibet a sort of autonomous freedom from China. I like your website. I was thinking how about Indus river/Senge Tsangpo? Which originates from Ngari (Western Tibet) and flows through Ladakh, India and eventually reaches Pakistan. How about river Indus? It flows from Ngari (Western Tibet) near Mt. Kailash and passes through Ladakh, India and eventually into Pakistan. This place is a paradise! And did you say you can do some water rafting here? COOL! I think you can also do some camping and hiking here. Hhhmmm.. I think I'll visit this place soon! That's the real beauty of god's creation. Thanks for sharing your blog. I like it. Thumbs up for your blog. By just looking at those cool river pictures I'm already getting excited to try some for myself with this exciting water rafting adventure very soon. I wish I would have a great experience and share it to you! Thanks for inspiring me! The river you are thinking of is the Yellow River. thanks i am just trying to find a river that goes down tibit into lanzhou so thanks a lot.